Acknowledged author Peter G. Northouse wrote Introduction to Leadership: Concepts and Practice comprising 368 pages back in 2017. Textbook and etextbook are published under ISBN 1506330088 and 9781506330082. Since then Introduction to Leadership: Concepts and Practice textbook received total rating of 4 stars and was available to sell back to BooksRun online for the top buyback price of $20.80 or rent at the marketplace. 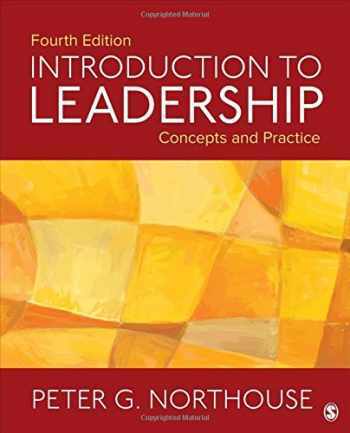 The Fourth Edition of Peter G. Northouse’s bestselling Introduction to Leadership: Concepts and Practice provides readers with a clear overview of the complexities of practicing leadership and concrete strategies for becoming better leaders. The text is organized around key leader responsibilities such as creating a vision, establishing a constructive climate, listening to outgroup members, and overcoming obstacles. Three interactive components in every chapter―self-assessment questionnaires, observational exercises, and reflection and action worksheets―get readers actively involved in applying leadership concepts to their own lives. Grounded in leadership theory and the latest research, the fully updated, highly practical Fourth Edition includes a new chapter on how leaders can embrace diversity and inclusion, as well as new material on the dark side of leadership and a new ethical leadership style questionnaire.